Many of you are probably already fans of ginkgo biloba - its efficacy is well-established. Ginkgo biloba is mainly used in the prevention of Alzheimer’s disease and senile dementia. It improves energy, memory and concentration. This is what makes it one of the most popular natural remedies available . Ginkgo biloba is an extraordinary tree which has existed since the beginning of time, first appearing 300 million years ago. In comparison, dinosaurs date back 230 million years, and man just five million years. Charles Darwin called ginkgo biloba “the living fossil” because it is the oldest known species of tree - there are specimens around today that are identical to those that existed 300 million years ago. 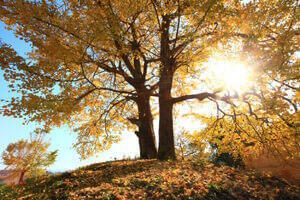 Ginkgo biloba can reach a height of 50 metres and live for up to 1000 years. Following the Ice Age, ginkgo was only found in China. Its virtues are mentioned in the work attributed to the legendary Chinese emperor Shen Nong, The Divine Farmer's Herb-Root Classic ,which dates back to around 2800 BC. Chinese women used to collect the ginkgo fruit which fell from the trees in autumn. They wore gloves as the flesh of the poisonous and foul-smelling fruit can cause skin allergies. The fruit’s kernel was used to treat asthma and bronchitis. The fact that it has survived so many thousands of years is due to its incredible resistance to environmental changes and pollution. It is virtually indestructible: the first vegetation to grow again following the dropping of the atomic bomb on Hiroshima in 1945 was a charred ginkgo biloba! It is a truly exceptional tree. The leaves of ginkgo biloba improve blood circulation. They increase the fluidity of the blood, improve its oxygenation and dilate the blood vessels, increasing their rate of flow. Thus blood supply to the brain is improved which has a positive effect on cognitive function - including memory and concentration. Gingko is also a powerful antioxidant which protects nerve cells from free radicals. Its neuro-protective effects help prevent the onset of Alzheimer’s disease. It is a seriously effective plant: ginkgo leaf is recommended by the World Health Organization (WHO) and the German Commission E on herbal therapies for treating dementia, memory loss, concentration problems and depression. For decades, ginkgo biloba-based prescription drugs have been the most-commonly prescribed medicines in Germany . And consumers there are reimbursed for them confirming that Germany has always been one step ahead when it comes to natural treatments. •	An analysis of eight randomised, double-blind, placebo-controlled studies concluded that ginkgo had beneficial effects on symptoms of dementia and cerebral insufficiency, comparable to those from the dihydroergotoxine in drugs such as Hydergine. [1-2]. • A review of double-blind, placebo-controlled studies of more than six months’ duration showed that ginkgo extract was also as effective against Alzheimer’s disease in its moderated form as second-generation cholinesterase inhibitors . • A review of nine studies concluded that ginkgo was more effective than placebo at treating dementia . • A placebo-controlled clinical trial highlighted that a ginkgo biloba-based medication had a a positive effect on cognitive function in Alzheimer’s patients. • A review conducted in 2010 of all clinical trials lasting over 12 weeks concluded that ginkgo had a significant effect on cognitive function in all cases of dementia . • Both the Epidos Study conducted on 7500 French subjects and the Paquid study monitoring 4000 patients for 15 years demonstrated the effectiveness of regular supplementation with ginkgo on Alzheimer’s disease. • In a three-year clinical trial on 118 volunteers aged 85 and over with no prior memory problems, researchers discovered that those taking ginkgo had a 68% lower risk of developing memory problems compared with the placebo group . • A large-scale clinical trial showed that a ginkgo biloba-based medication was just as effective as the drug donepezil (Aricept) in Alzheimer’s disease . Overall, ginkgo biloba has been shown to be at least as effective as conventional drugs in delaying Alzheimer’s disease and alleviating problems linked with cognitive decline. as well as in protecting against radiation. A good way of benefiting from ginkgo’s virtues by is to take a ginkgo biloba supplement. The leaves are collected in the autumn when they turn yellow. It takes 50kg of leaves to obtain 1kg of ginkgo extract. PS Ginkgo biloba is not recommended for those taking anticoagulants or for haemophiliacs as it makes the blood more fluid.